Several years ago I attended a Fancy Dress Ball held by the Atlantic Guard Soldiers Aid Society (AGSAS) in Belair, MD. As soon as I heard about the event I was psyched and knew that I had to attend. 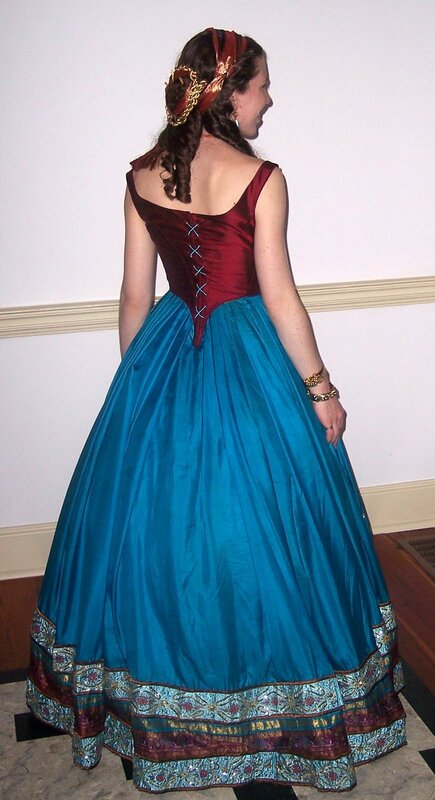 I love the idea of making a costume for a Fancy Dress Ball through the mindset of a Victorian woman. Did you get that? So, the costume has to be authentic to what someone of the time would have created had they attended a Fancy Dress Ball. It adds a great challenge to the whole costume. 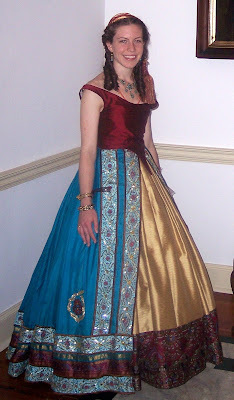 I had been studying Orientalism at the time through paintings and books of the 186os, so I wanted to do a costume influenced by my love (and the Victorian love) for Orientalism. I chose this image of Empress Eugenie in a harem costume as my inspiration. The Blue Silk Overskirt was made from an antique Sari from India. I purchased 14+ blue belts at Target and stitched them to the skirt. 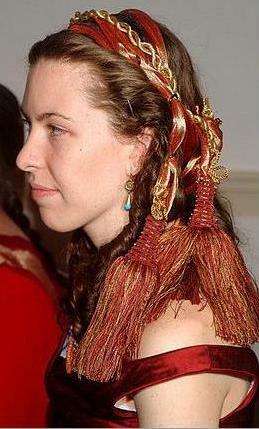 The belts are made of blue satin with red and gold beaded designs. I off one end of the Sari and attached it to the bottom of the underskirt. 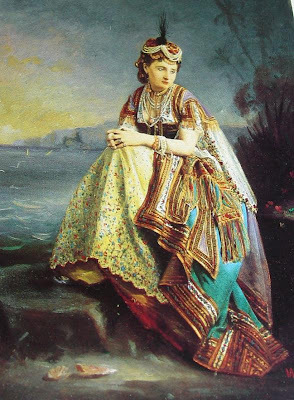 Beaded appliques were stitched to the skirt in a paisley design. My original plan was to have them the whole way around the skirt, but I didn't have time to stitch all of them on at the time. The headdress consisted of beautiful tassels attached to sheer red ribbon and another gold cord - all draped into place and secured with hair pins. I really like the way it turned out, and I had tons of fun wearing it! I'm soooo looking forward to this upcoming Fancy Dress Ball and sharing my latest creation with you! How fun! I love your gown, it's just gorgeous. And you looked fabulous there, Lindsey!! You do really beautiful work!